Ok, so it was not Nelson Peltz, but last night a 13D was filed on CBRL by Sardar Biglari owning a 9.7% stake. The restaurant industry is an easy target for activist investors to push around bad management teams and CBRL is no exception to that rule. Sorry, Mr. Woodhouse; your track record speaks for itself, especially knowing that this is the second time you will be faced with an activist shareholder. Sadly, the last time Mr. Woodhouse was challenged to create shareholder value he failed (see my table below) and, in fact, I have made the case that the concept is in secular decline. It could be argued that the company is in worse shape than it was in 2007. In the 2006/2007, when CBRL faced Nelson Peltz, the stock peaked at $50.74. Given the secular decline I see in the concept’s business, I don’t see much value past the $50 level, because the cost of fixing declining traffic trends is both time- and capital-intensive. The questions investors need to ponder are: can Mr. Woodhouse fend off Mr. Biglari and what will he do to create value? Will he pursue the same path he did against Nelson Peltz? Look no further that the 2007 proxy for Mr. Woodhouse’s success plans four years ago. It is plain for all to see how he benefited from the situation. Will he turn this current scenario into another big payday for himself? If history is any guide, he will. From the 2006 proxy: “The Success Plan was adopted in order to reward certain key personnel, including certain executive officers of the Company and its subsidiaries, for undertaking and for various degrees of success in implementing the restructuring plan announced March 16, 2006. The restructuring (the ‘Restructuring Plan’) includes implementation of a modified Dutch auction style tender offer in an amount of at least $700 million and related financing (the ‘Tender Offer’) and divestiture of the Company’s wholly-owned subsidiary, Logan’s Roadhouse, Inc. (the ‘Logan’s Divestiture’) at one of two levels of proceeds (the ‘Target Level’ and the ‘Maximum Level’). As in 2006, my guess is that the street will focus on the real estate and the potential for a sale/lease back transactions to create value. To be clear, this has never worked and will not work this time. Bill Ackman has tried the strategy many times and it has never been proven to work. It can make for good headlines, but that is about it. This time around there is not another concept to divest. This only serves to highlight just how bad things are at CBRL today. 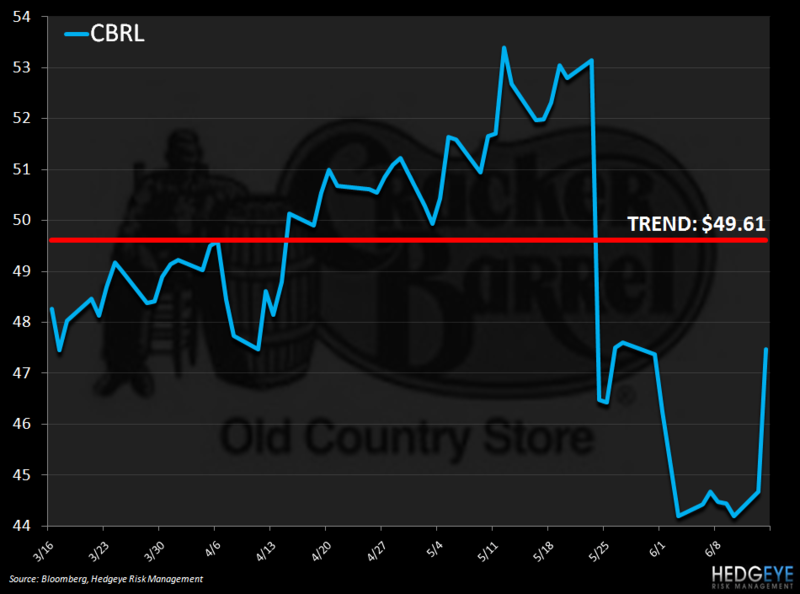 The sale of Logan Roadhouse was supposed to allow the current management team to focus only on the performance of the Cracker Barrel concept. If traffic trends are a benchmark for the measurement of success, then it is important to note that traffic trends are significantly lower today than in 2007. I let you be the judge of the company’s performance since the beginning of fiscal 2007. The store base has grown by 11%, sales by 2.3%, EBITDA by $3.4 million, EBIT has declined by $68,000 and the share price has gone nowhere. All the while, Mr. Woodhouse has pocketed approximately $37 million in total compensation over the same period. Allowing that to sink in, the only word fit for print I can think of is “embarrassing”.